One of my favorite go to meals when I really want to please my husband is chili. He loves anything spicy and has never met a chili he didn’t make friends with! Normally, I cook it in the crock pot or give it a low simmer on the stove for hours. But tonight, I just had a hankering for it myself, and didn’t have the time for a long cook. I came up with this smokey 3 bean chili and it has the most amazing flavor. No one will know it is one of your 30 minute meals! 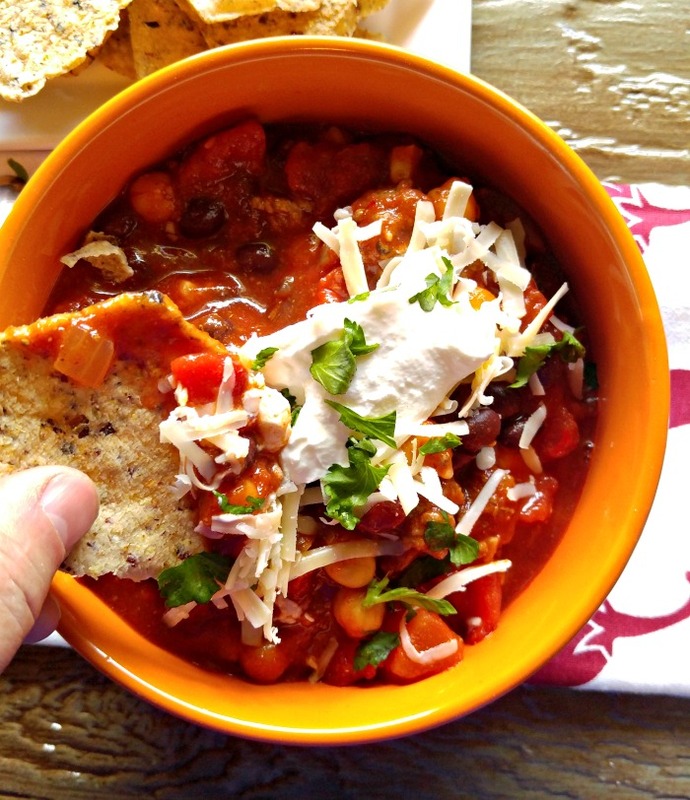 As fall approaches, I find myself thinking more and more about a big bowl of chili. Nothing seems to do the job of warming me up quite like a tasty chili recipe. (See my One pot chile con carne recipe here. 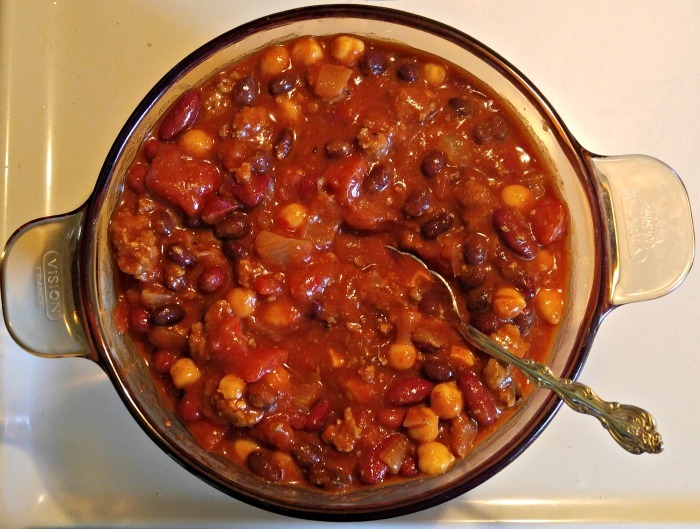 This smokey 3 bean chili is ready in a flash and tastes like you spent hours making it. This chili has a bit of spice, but not too much. It makes hubby happy and I loved it too, even though I am not so much of a heat freak as he is. I love my chili recipes more on the savory side with plenty of flavor but not too much heat. After a quick chop of the onions and garlic cloves, I heated the olive oil and sauteed them in a non stick pan for a few minutes until they were tender. I added the ground beef to the same pan and then put everything in a large saucepan to cook for about 30 minutes. (You can cook it longer and the flavors will get more intense as you do, but it’s really just fine after a half hour, which is what I gave it today. This rich, smokey 3 bean chili has a bit of heat, a bit of sweetness and lots of savory tastes. It is thick and bursting at the seams with flavor. I served it tonight with some grated cheddar low fat cheese, a dollop of light sour cream and a new find that I just love quinoa and black bean tortilla chips to scoop up every last drop. Go on…you know you want to make a batch. 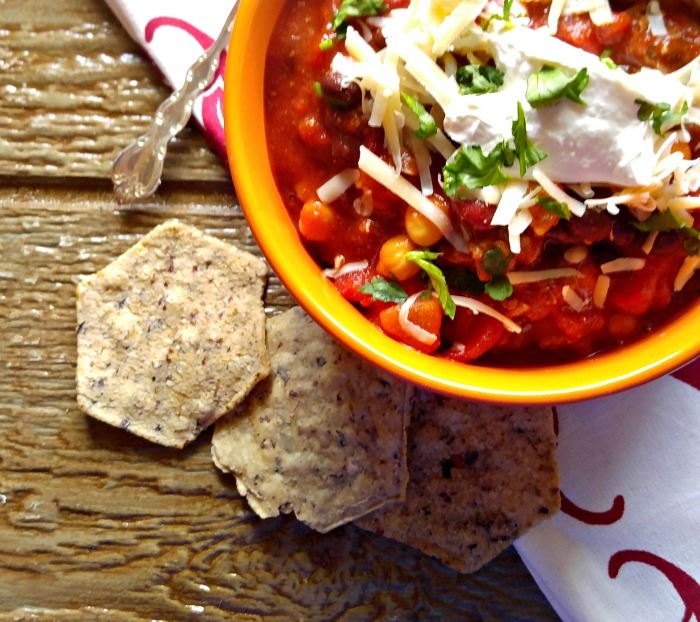 What is in your pantry that you can add to this delicious smokey 3 bean chili? 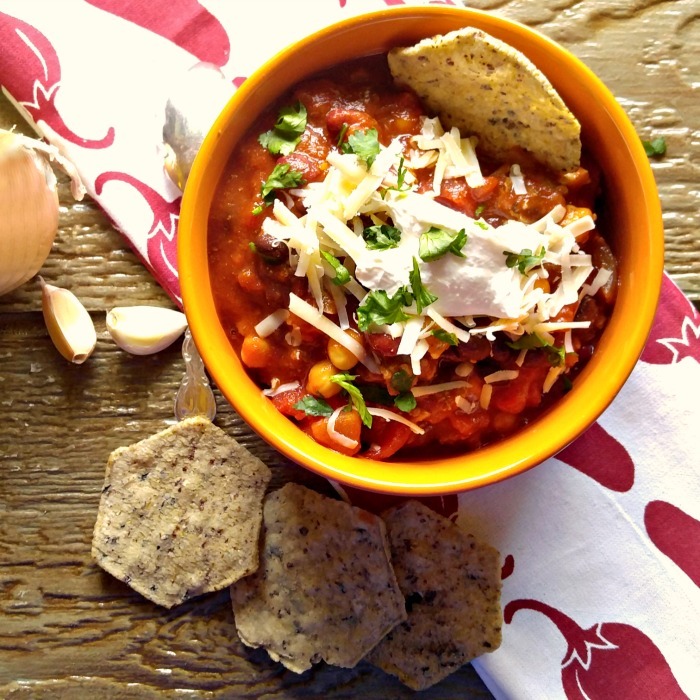 If you love chili, try this savory and hearty white bean chili. Heat the olive oil in a non stick pan. Sauté the onion and garlic until tender. Add the ground beef and cook until no longer pink. Place this in a bottom of a large dutch oven and add the remaining ingredients. Cook on medium low heat for 30 minutes. Serve with grated cheese, sour cream and some Quinoa and black bean tortilla chips.